Released through: UDR / EMI. Release date: Available now. Saxon are a band that readers of this site, for the past year or so have probably realised have indeed regained my support, with reviews in the past two years of CD’s, DVD and a gig review here in Detroit, during their ‘A Call To Arms’ tour. I think I’ve already said plenty about the bands background in my previous coverage, so for the sake of regulars here, I won’t bore you again, for newer visitors just use the search function here and type in Saxon and you should find plenty to get you up to speed! I will back track just a little though, to add that I thought ‘A Call to Arms,’ was an absolute breath of fresh air to me and the documentary ‘Heavy Metal Thunder – The Movie’ great stuff indeed. Biff Byford (Vocals) and Paul Quinn (Guitars) have been with the band from the start and current drummer Nigel Glocker (Drums) joined the band originally in '81 and although he has dropped in and out of the band here and there, he is the longest serving drummer to date with the band. For his latest stint with the band he's been back onboard since around 2005. Then there's the multi-talented Nibbs Carter (Bass, Keyboards) who's been with the band since '88 and 'newest' member Doug Scarratt (Guitars) who's been around since 1996. They are a serious force to be reckoned with these days and have really got back into a great stride once more! Now we get ‘Sacrifice’ with a warning to all-comers ears that this is a little darker at times and certainly a heavier affair, no question about it. That said I have no doubt that those fans of the era of Saxon that covered their heavier, less commercially edged stuff will love this! Ed’s note: This copy of ‘Sacrifice’ is actually the second one I received, as the original promo for whatever reason came to me as a white labeled promo, but sadly it was just a blank disc, so I had to wait for the album to become officially available, before getting this copy. This one is fine by the way, but apologies for the review getting here a later than originally planned. Intro track ‘Procession’ basically for me just delays getting into the album proper, but you know, it kind of brings back memories to me to how expectant I was of UFO when they released ‘No Place To Run’ the first post Michael Schenker era release. Sure enough it then launches into title track ‘Sacrifice’ and it’s a ‘get in there lads’ kind of approach, dirty metallic riffs double bass drums pounding and musically almost Metallica meets (Iron) Maiden. For the most part I’m OK with the heavier switch back for the band, although I’m really not into the demonic echo on Biff’s vocals in the backing vocal ‘Sacrifice’ in the chorus. A little too dark, in that sense and kind of kills it a little for me. ‘Made in Belfast’ starts with a little mandolin at the beginning before the bass and kick drum ease in and then some seriously crunching, dirty heavy riffs, before the song itself kicks in. The mandolin returns here and there and you kind of perhaps wonder, ‘what’s the point,’ with so much heaviness elsewhere in the song. It has its moments for me, but it just seems a little bit of an odd structure. I’m very much reminded of earlier Saxon following the intro sound of a formula one car zooming by and then the opening riff of ‘Warriors of the Road,’ but here vocally Biff seems to push his voice a little harder it seems through the verses, perhaps a little more than he should and then the chorus actually seems very Maiden like. There’s some interesting timing changes throughout and I do like the song overall, it is heavy, but good! Next track ‘Guardians of the Tomb’ from its title right down to its structure is almost like the band paying tribute to Iron Maiden, seriously and forgive me but doesn’t the chorus come across just like the previous track? They are very similar choruses indeed. Sounds good, don’t get me wrong, but … Well, when you hear this, you’ll know what I mean I’m sure! ‘Stand Up and Fight’ just really grabs me from its opening riff through the chugging verse into the very catchy chorus. It’s a familiar Saxon song structure if heavier crunching, chugging chords throughout. Great guitar solo, really love it! For next track ‘Walking the Steel’ the band almost to some extent, resurrect the elements of ‘Denim and Leather’ for the basic groove. Classic Saxon fans should most certainly relate to this one. It’s a solid, steady stomper generally with a wonderfully eased back bridge around the song’s midpoint, with some nice solo guitar work. Works for me! ‘Night of the Wolf’ starts with a frenzied guitar assault before easing back a little for the verses and then crunching guitars once more for the chorus, then the bridge bring in acoustic guitars for a nice interlude before building back into its main groove, where it’s seriously heavy. It’s an epic like track, with its light and dark touches throughout. The very dark ‘Wheels of Terror’ has a kind of Metallica vibe to it and pretty much maintains this throughout. I’ve read in other reviews criticisms of the final track – on this standard version of the album. – about the very basic nature of the song title and lyrics for ‘Standing in a Queue’ and yes, OK it is simplistic in that sense, but it’s no doubt Biff and the guys association with their fans. Think ‘And the Bands Played On,’ ‘Denim and Leather,’ ‘Back In ’79,’ etc for common threads here. Yes, it’s basic in that context, but it worked before and otherwise it’s a good solid Saxon rocker to close the album. This review covers the basic standard album that has a surprisingly short running time of just over thirty nine minutes and while you may track down the iTunes version with the bonus track, ‘Luck of the Draw’ that only adds another three minutes or so. There is a deluxe two CD version out there with five bonus tracks on the second disc, an orchestrated version of ‘Crusader’ done in similar fashion to what the band did on the magnificent ‘A Call To Arms’ release and its title track. Also on the bonus disc are different re-recorded versions of ‘Just Let Me Rock,’ ‘Requiem,’ ‘Frozen Rainbow’ and ‘Forever Free’ too. I have heard those tracks and they are very well done. As a bonus disc, I think it’s great! It’s funny, nay sad that Saxon seem to be reducing the length of their new album material each time a little more over the past three releases and I’m not including the bonus stuff, that you’d have to pay more for if you wanted those versions, but just look at the pattern: 2008’s ‘Into The Labyrinth’ was just under fifty five minutes, ‘A Call To Arms’ clocked in at just over forty three minutes – Again ignoring pricier bonus version. - and now ‘Sacrifice’ at under forty minutes. Perhaps it’s a theory of quality over quantity being used, as that was pretty much what Steve Lukather (Toto) had told me about his last solo release ‘Transition’ being so short and also that most people’s focus tends to drop a little if something becomes a little longer, drawn out some songs may possibly be considered mediocre. Perish the thought! I personally think it’s a shame, but maybe there’s more to it, relating perhaps more to so much ‘stealing’ of new music from artists, where certain ‘individuals’ rip artists off, depriving them of potential royalties by file sharing again and again and I know firsthand, that this tends to put artists off recording complete new albums these days. Many artists have told me that why should they bother taking countless hours in writing new material, going through the painful hour after hour recording and doing retake after retake, because they want it perfect, only for thieves to steal it, sometimes before it’s officially released. Sometimes even before review promo copies are available to reviewers like myself, it’s just wrong! 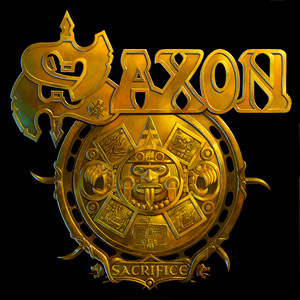 Saxon’s ‘Sacrifice’ is once again a good release, to me personally and it is just me when I say that I don’t think it’s as strong as ‘Call To Arms’ it’s like it’s lacking something, but to Saxon fans, it’s metal and that’s all that matters, right ….? !